Well, I don't know why you quoted me, I'm one of the few people who actually liked playing as Jack, because I could finally do my own thing and didn't feel held down to John Marston's moral code. I mainly said it to be snarky, rather than actually believing it, or even caring. But isn't it quite a coincidence, that Rockstar kills off their most beloved, deepest character developed protag, in their next game after they found that GTA Online is an absolute license to print money? Just sayin' 😛 Actually, I doubt that RD Online is going to be any more than minimally profitable. It just can't have the same draw. More generally, I was hoping that the next Rockstar western game, which of course had to be made, due to the unexpectedly huge success of RDR1, would have a completely different set of characters, a wholly different story. I was disappointed when it became clear it was going to be a prequel. The enthusiasm just isn't there. I think your prejudice ruins the story for you. I do agree that I would have preferred a story set in the 1870’s-80’s, but still the story of RDR2 is brilliant and I had several moments where I fondly remembered stuff from RDR1. Arthur dying is just a given or he would have been the main Star of RDR1. There is no other way it could end considering the bond of A and J, when Arthur wasn’t in RDR1. I hope for online they go with the 1818’s, but it’s unlikely. RDR2 is a story stretched beyond belief, to introduce such a major new character, that was never ever mentioned in the sequel. The prequel concept was a mistake from the get-go. Arthur as a character should have had his own story, a protag in his own right, without the drag and complication of that whole gang thing, which Rockstar had to create from the flimsy references in RDR1. A story where, for example, Arthur develops his character, starting as a simple gunslinger thug, to a legendary western hero, with a questionable past, and questionable alliances, with many exciting adventures along the way. Rockstar could have simply made a few easter egg references to the Dutch/Williamson gang, dropping a few names like Dutch, Williamson and Marston, as a minor element of one RDR2 mission series, where the gang never even knows who Arthur is. Oh, well. I'm not one to argue with experts who can repeatedly create billion dollar media properties. I had the same fears when it was annnounced that RDR2 was going to be a prequel but I think it was definitely worth it 100%. Looking back at RDR1, it was basically just the epilogue to the gang's story and more focus was given to all sorts of quirky characters like Seth, West Dickens, De Santa etc. now that's fine but I think Rockstar realized that the fall of the gang had too much potential to be wasted so they did a prequel which turned out to be a good idea. The story was far superior to RDR1's and Arthur is the best written Rockstar protagonist (not to mention the added depth to Dutch's character, more impact for John's arc etc. ), definitely wouldn't give this up for a completely new story for which there is still "RDR3" (maybe they will scrap the redemption part for that but it's definitely coming..in a decade or so lol). I'm not too pissed off about it, but I found it a bit off putting that one of his first entries in the journal is "I killed a man for looking at me funny." This is the guy Arthur fought tooth and nail for in the end? I didn't like the epilogue until "Jim Milton, rides again?" and I heard that classic music and saw that classic pose, but before that point I really couldn't reconnect with John at all. Just completed the story in full. It was so satisfying to kill that Micah f*ck, but I have to be honest the entire time I was thinking to myself "god I miss Arthur". I felt like the epilogue picked up when John dawned his classic gear (that was a cool nostalgic moment) and it was a nice touch that we got to see him build his home and propose to Abigail. It was a strange feeling because while Arthur's death was heart wrenching it was awesome to kill Micah, but the "happy ending" for John feels a bit diluted knowing he's going to be dead in 4 years anyway. I loved the story i really did, but one of the things I wasn't too sure about pre-release was the whole Dutch's gang angle. Arthur was such an interesting character, but I think what someone said the other day in another thread was right. It's really John's origin story told through the eyes of Arthur. While I'm happy it added some more layers to John giving another play through of Red Dead Redemption more intrigue I think I would've still preferred an independent story with Arthur and some slight references to Red Dead Redemption. Arthur was such an interesting character, but I think what someone said the other day in another thread was right. It's really John's origin story told through the eyes of Arthur. I’ve seen this sentiment written a few times since reading opinions after finishing the game yesterday, but I can’t say that I agree with it. I will say that while playing the epilogue it originally felt as though it undermined Arthur's role in the game but over time I saw it for what it truly was. Arthur gifts John with the life he wanted. He always wanted the gang to move out West someplace, for them to settle down and become ranchers. He wanted to run away with Mary, who he still loved despite everything. Arthur had deep regrets about what happened to Eliza and Isaac, his son, which is why he so heatedly disliked John for abandoning Abigail and Jack for a year. The game asks us if a man can ever really change. Arthur answers “it’s too late for me, but maybe not for John.” The entire epilogue is the answer to that question. Maybe it was too late for John too? Maybe Arthur was wrong and it was all for nothing. John finally answers the question in the final cutscene: “It’s over,” he says to Abigail. 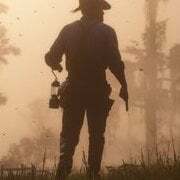 The entire epilogue, the fact that John is alive and pursuing a better life with Abigail and Jack in the first place, is a testament to the life of Arthur Morgan. I love Arthurs character, a lot of people were expecting him to be boring, but he exceeded all my expectations. After Arthur died I was pretty bummed out, I'd begun to like him more than John and was actually sad to be playing as John. As the epilogue progressed however, I started to remember just who I was playing as. It first hit me when this music started playing during the "Jim Milton Rides Again" mission. Then there was the house building segment, probably the most wholesome part of the whole game, which finally lifted my mood after what had been a incredibly bitter ending to chapter 6. It still felt weird playing as John though. For me Arthur and John are joint 1st for Rockstar Games best protagonist.